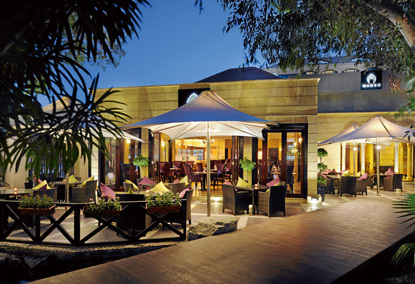 Contemporary Indian food is the true ID of Mahec restaurant that is to be found at Le Méridien Hotel in Garhoud, Dubai. This spot stands for rich and spicy flavours of India, as the food served here is carefully marinated in the Indian spices and other freshly grinded ingredients to produce excellent taste and aroma. The authenticity and majestic flavours of this bistro’s food have made it more prominent, as compared to its competitors. The set menu of Mahec includes specialties like lamb roganjosh, orange duck, quail, tiger prawns, curries, kebabs, biryani and much more. This mouth-watering menu is enticing enough to drag any Indian foodie to this restaurant that is stylish decorated and provides all essential services. Mahec at Le Méridien Hotel is a great place to take pleasure in modern Indian food. Vegetarians will also get appetizing dishes at this venue. Tender seafood, poultry and meat items are prepared with fresh ingredients to bring the rich Indian taste and these are accompanied by hot hot naan and roties from tandoor. Exquisite range of wine and other beverages on the menu of this bistro are helpful in washing down the scrumptious food of Mahec. People of Dubai can drop in at this eatery not only for lunch and dinner, but also for brunch. Plus they can enjoy the contemporary Indian food either in cosy indoor or outdoor seating facility, which makes this spot even more alluring and an ethereal experience for the visitors. Mahec serves lunch from Sunday to Wednesday between 12:30 pm and 3:30 pm, during same days dinner is dished up between 7:00 pm and midnight. While from Thursday to Saturday this place serves dinner only and its timings are from 7:00 pm till 1:00 am. Le Meridien Dubai, Airport Road - Dubai - United Arab Emirates. Airport Terminal 1 Metro Station 2 is 1.1 kilometers away from the Mahec Le Méridien, which makes it 15 minutes walking journey. If patrons head out in the northwest course from this metro station and then keep right at the fork before making a left turn onto D 70. After that patrons will make another left turn, which will bring them close to the destination that is located on the right side. Bustan Rotana Hotel 2 – Dubai bus stop is the nearest bus station from Mahec Le Méridien and bus number 32C serves this point. Therefore, guests can easily arrive at this bus top and then can head north on D 70 before making a right turn in order to reach the restaurant that is on the right side. Follow map for directions.